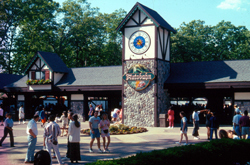 The investment of major capital by Time Warner into Six Flags Great Adventure continued for 1994. Four main projects highlighted the changes for the new season, the largest of which was the addition of The Right Stuff Mach 1 Adventure simulator ride. Based on the epic film The Right Stuff, Great Adventure's new attraction put guests into one of a hundred cockpit seats on a mission to break the sound barrier. 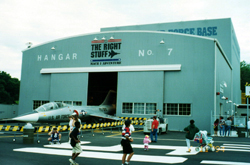 From the massive hangar which housed the attraction to the countless props that set the scene for your assignment, The Right Stuff Mach 1 Adventure provided some of the best story telling ever presented at Great Adventure. A second ride was also added this season but more out of necessity than part of some long term plan. The Autobahn bumper cars were added to the Old Country area of the park filling the void for the destroyed Traffic Jam bumper cars from the previous season. Autobahn made use of the cars from the Traffic Jam ride and also featured four Bavarian themed games of skill stalls which proved popular with guests. 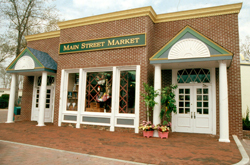 A huge new Looney Tunes Shoppe was constructed down the entire length of the left side of the Main Street section of the park and all the stores in that area had extensive makeovers to extend the colonial theme of the section. 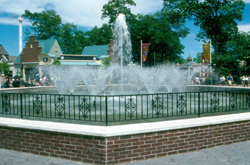 Brick pavers replaced poured concrete from the ticket taker booths all the way down to a new smaller fountain which utilized the plumbing fixtures of the original park model. 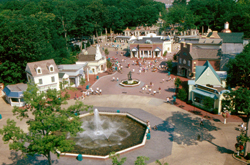 The reduced octagonal footprint of the new fountain allowed for better traffic flow in and out of the theme park. 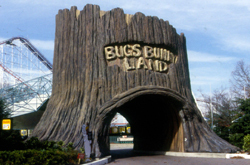 And in addition, the rainbow entrance portal to Bugs Bunny Land was replaced by a massive faux tree stump which beckoned the park's smallest guests to their own pint-sized park within the park. 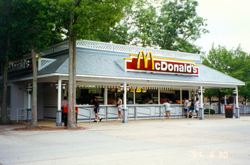 Other minor projects included the introduction of a McDonalds in the park, new lighting throughout the parking lot, and the addition of a new white Bengal tiger area in the drive-thru Safari park. The combination of all the new attractions and theming definitely made it apparent that Time Warner was up-ing its game. Maybe it wasn't quite Disney yet, but with the introduction of all the Warner Bros. movies, characters, and businesses, it seemed that we were at least approaching the level of the Universal Parks. 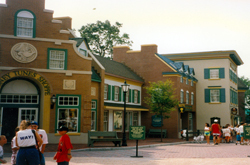 Even though the advertising slogan was long retired, it seemed like the park was "a whole new adventure" yet once again.